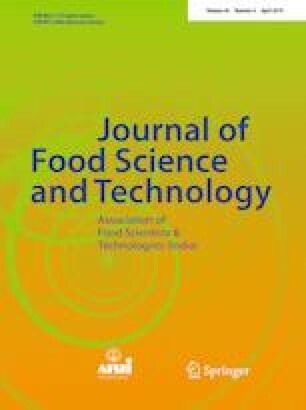 A total of 384 broiler chicken of same hatch and uniform body weight were used to assess the role of saponins in meat quality. The soapnut shell powder obtained from Sapindus mukorossi was used as a source of saponins. Following a 4 × 2 factorial design broiler chicken diets were supplemented with four saponin levels (0, 100, 150, 200 mg/kg diet) and each provided for 42 (0–42 day) and 21 days (21–42 day) resulting into eight dietary treatments. The results revealed that dietary saponin supplementation significantly (P < 0.05) and progressively decreased the cholesterol, fat content, and peroxide values (after 30 days of 0 °C storage) of breast and thigh meat. There was a progressive and significant (P < 0.05) increase in the ABTS and DPPH values of broiler chicken meat with increasing dietary saponin levels. However, the effect of dietary saponin level of 150 mg did not differ significantly from 200 mg level. The peroxide values of breast and thigh meat after 30 days of storage and TBARS values of fresh breast and thigh meat as well as after 30 days of storage were significantly (P < 0.05) higher in control group compared to other groups supplemented with different saponin levels which did not differ significantly (P > 0.05) from each other. Further, significantly (P < 0.05) better antioxidant and lipid oxidation status was observed by supplementing saponins for 42 days duration compared to 21 days. Thus, it was concluded that the dietary supplementation of 150 mg saponin/kg diet of broiler chicken for 42 day duration results in better meat quality with better lipid oxidative stability. The online version of this article ( https://doi.org/10.1007/s13197-019-03683-z) contains supplementary material, which is available to authorized users.